Urban Decay Beached Collection review, photos, swatches! Ooh I love summer makeup because I get to go wild with a bit of colour, now not too wild as am a severe geriatric, but there are ways us bridies can try something new with colour and not look mad! The Beached collection from Urban Decay is a gorgeous range. I fell in love with the palette when I saw it on Instagram a while back and hoped it lived up to my own self made hype. I didn't know there was going to be an entire collection until they sent it to me to play with and colour me impressed. Want to see more? Thought so! The Beached palette (€34) houses eight eyeshadows, one matte and seven shimmers and if there's one thing Urban Decay know how to do (ok they know how to do a lot) but they know how to give good shimmer. All of them are buttery soft and while there's a small bit of fall out, it's worth it because they are beautiful! 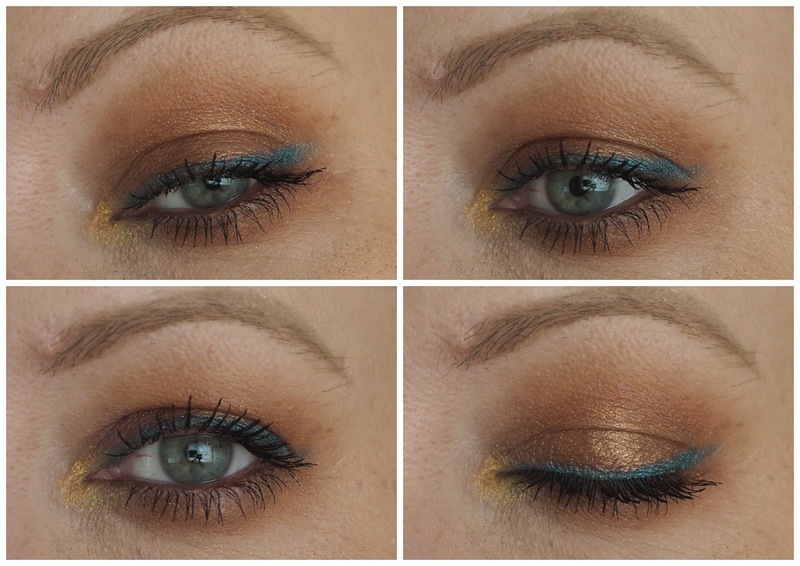 The pops of blue with Double Dip and Plunge transform it from being a grand summery bronze palette to something with a bit more interest. And while I'm not skilled enough, cool enough or brave enough to wear the blues as the main colour on my eyes, I can do a mean pop of colour under my lower lashes! And in the look below, you'll see I tried to do something a bit different. I'm no MUA but I love how it turned out! I'd advise to use a flat eyeshadow brush when picking up the colours as there's a bit of fall out with a fluffy blending brush or use your fingers. There's one matte shadow which makes for a lovely crease shade, and this is me just being picky, but I'd have loved a slightly more neutral matte as a transition shade. But apart from that, it's a stunning palette for summer and leaving out the blues, it's one that I'll use lots year round too. There are two eyeliners (€19.50) in the collection, a deadly yellow gold called Goldmine and that fabulous copper shade called Lucky which I'm all over. In the look above I used Goldmine in the inner corner and Lucky on the waterline. If you want to see a video of how I did the eye look, head to my Instagram page where I uploaded a one minute video showing it in action. To the right of the copper liner I've swatched the Beached bronzer in Sunkissed (€30) and in the compact, it looks quite red toned, but on the skin, it gives the most beautiful natural warmth. I think the slight hint of red makes it look like you've just caught the sun rather than wearing makeup if that makes sense. I didn't think it was going to look as well on me and I had visions of having to blend it out with my foundation brush, but it's so flattering on, it's so finely milled and applies like silk to the skin. You'll be seeing a lot of this on my face this summer! There are three lipsticks (€19) in the collection, all with the cute beachy palm tree packaging. Two are part of the metallized finishes and one is sheer. Swatched on the back of my hand is one thing, but you have to see them on the actual lips don't you? Keep scrolling! The Beached Lipstick in Heatwave is a true copper lipstick and if you're a fan of a metallic finish, you're going to love this. It's not drying, one layer gives great colour pay off, I'm just not sure I can get away with a metallic lip like this! I blame old age! Next up is the Beached lipstick in Tower 1, also described as being one of the metallized finishes, but despite looking copper and shimmery in the tube, on the lips, it's more of a lip topper than a lipstick itself. It feels like a lip balm on and has tiny flecks of gold and rose gold glitter running through it. It's gorgeous and I'll get loads of wear out of it when I want a look that isn't too in your face. Finally we have my favourite of the three lipsticks, the Beached Lipstick in the shade 100 Degrees. This is described as having a sheer finish but as you can see in the photo and the swatch on the back of my hand, it's definitely more on the pigmented end of the scale than it is sheer, but it's not fully opaque. This is a beautiful strawberry red, perfect for summer and I've actually worn this out of the house too! The Beached collection from Urban Decay is out now! Will you be picking anything up? Things that are helping me beat the heat!